Saffron | Become Healthy or Extinct! Saffron is a spice derived from the flower of Crocus sativus, commonly known as the “saffron crocus”. Saffron crocus grows to 20–30 cm (8–12 in) and bears up to four flowers, each with three vivid crimson stigmas, which are the distal end of a carpel. The styles and stigmas, called threads, are collected and dried to be used mainly as a seasoning and colouring agent in food. Saffron, long among the world’s most costly spices by weight, is native to Greece or Southwest Asia and was first cultivated in Greece. As a genetically onomorphic clone, it was slowly propagated throughout much of Eurasia and was later brought to parts of North Africa, North America, and Oceania. Disease prevention: One of the main saffron benefits when used in cooking food is that it contains many plant derived chemical components which are known to prevent diseases. They are also known to promote overall well-being of the body. Volatile oils: The plant part from which saffron is obtained contains essential but volatile oils which when added to food, imparts its unique flavour and benefits of saffron as a spice. Some of these oils are cineole, pinene, borneol, geraniol etc. Active components: Apart from the volatile oils, there are also non-volatile active components like carotenoid compound that are anti-oxidants beneficial to the body. These prevent free radical reactions which produce harmful by-compounds and diseases. Some of the carotenoids like zea-xanthin, lycopene, alpha and beta carotene are widely appreciated. This is also one of the main uses of saffron. Therapeutic applications: In many religions, saffron is not just considered a spice. It is used in various types of therapies like body healing, detoxification and also in the spas. 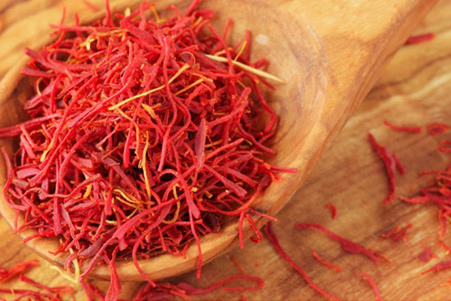 Anti depressant: The active components in the saffron make our body lose its depressing characteristics making it a dietary necessity sometimes. Digestive properties: Saffron is also a digestive and an anti convulsant. Cell formation and repair: Potassium, found in saffron, is a necessary source that favours cell formation and repair. Heart diseases, blood pressure: Potassium also helps maintains the blood pressure and keeps heart diseases at bay. Blood cell production: Iron is a very useful component in the body as the blood requires it to form haemoglobin and it is a co-factor in the red blood cell production too. Optimum health: The overall mineral content including calcium, vitamins, proteins etc present in Saffron ensure the maintenance of optimum health.